Briefly outline/discuss the theoretical framework you have chosen – discuss why your chosen framework is more appropriate for your essay rather than another framework (yes, outline briefly the other framework concepts as well) Argument = taking a viewpoint and justifying it. Incorporated in New York, General Electric (GE) is an American Based multinational conglomerate and has its headquarters in Fairfield, Connecticut. The company works in the form of several segments which are namely: Technology Infrastructure, Consumer and industrial. As per Fortune 500, in the year 2011 GE was ranked as the 26th largest firm in US in terms of gross revenue. Other than that as per that survey they were taken to be the 14th most profitable company in US. Taking further metrics into account, the company was listed fourth largest throughout the world on the list of Forbes Global 2000. Other than it has also received the honor to be the 7th largest in leaders for Fortune and 5th best global brand for Interbrand. Getting to the history of the company, the company was one of the 12 different companies listed in the Dow Jones Industrial Average in the year 1896 (Cox & Blake, 1991). Since then and till now after 118 years, General Electric still remains to be one in the Dow index. Thomas Edison, in the year 1889, had business interests in companies related to electricity. Several companies like Edison Machine Works, Bergmann & company and some other companies came up together to merge themselves together and made up to be under one corporation and formed the Edison General Electric Company. It got incorporated in the year 1889. During the same time companies like Charles Coffin, and Thomson Houston also came up to gain access and merged with the parent company. This merger was held in the year 1892 and General Electric was formed. General Electric with IBM (Schein, 1990), Honeywell, NCR, RCA as well as UNIVAC, became a major computer companies among the eight major companies in the year 1960. After 1962 they started developing GEDCOs operating system. GE recently ventured with and collaborated with Quirky and announced its connected bulb named link, which is basically designed to communicate with smartphones and tablets. Of late a lot of emphasis is being laid on ‘Organizational cultures’. There are broadly four major categories of organizational culture: the power culture, the role culture, the task culture, and the person or support culture. In 19742, Harrison came up with an extensive questionnaire format wherein he clearly compared and analyzed all the organizational cultures. The power culture has been explained as a spider web (Alvesson, 2012). With spider right at the centre and power centralized in the hands of few. In this type of culture dependence is on individuals. In such a kind of organisation, success is judged on the output, and not the means and values to attain he output. It is important for the employees to understand that they work in an environment which requires them to deliever work in the manner in which the boss at the centre is expecting them to act. In consideration to all dimensions of the national cultures and power distances which in a way reflect the range of basic questions on how to handle the fact that people are different. The second type is the role culture. Where each column has a different role or responsibility and even if any individual leaves, that pillar will still represent the task which will now be handled by yet another person (Cascio & McEvoy, 1992). Then, there also exists-‘task culture’ in various organisations. These types of organizations generally employ people to finish a certain project. Task culture is compared to a net. In a net, strands can be of varying thickness but the intersection points are strong. Similarly, such organizations believe in fulfilling certain similar tasks. Team-work is the buzz word in such types of organizations. Lastly, we have a ‘person culture’ in orgaisations. This is quite a rare sort of an organizational structure as the individuals are the focal points. This sort of a culture normally cannot be adopted practically by the companies as companies are the brain child of a person or group of people who have certain interests and these interests will definitely be over and above the interest of various people working (Marquardt, 1996). Now Harrison’s theory of comparison of various types of organizational cultures is of utmost importance as it compares. It lets an employee actually make out the organization type he or she is working for and thereby understand whether he or she will be able to adjust to the working requirements or not. With their former CEO, Jack Welch, the skills that were most admired and homed were cracking the deal, cost cutting and efficiency. The new CEO, Jeff Immelt has introduced a new system whereby he emphasizes not just on new deals and profit. But also on creativity. While applying to his new ideas, Jeff Immelt is continuously bringing a change in long practiced beliefs of GE. He is introducing outsiders into high ranks – this is quite a big change from the past. Earlier the policy was to promote only from within the organistaion (Deshpande & Webster, 1989). GE has applied this changed belief system in various other nations like China. Like for instance in the recent past, it has hired more than 1,700 new employees for a more global workforce. The most famous among such arrangements was proposed by Hofstede who led exploration among IBM laborers from diverse nations. He distinguished five measurements: independence/communalism, force separation, manliness/womanliness, instability evasion and long haul introduction. Among these measurements there is one particularly connected with relations in the middle of chiefs and representatives, it is the force separation. As per Hofstede's definition, the force separation is joined with the social acknowledgement of unequal conveyance of the force. This disparity can be associated with esteem, riches and influence. The level of the force separation depicts "how the way of life endures and cultivates pecking requests, and how effectively parts attempt diminish them" (George, Jones & Sharbrough, 1996). The high power separation social orders are portrayed by the resilience for disparity and the parts of such social orders concur that power ought to be unequally imparted. The individuals with higher social position acquire various benefits and it is considered as something right and characteristic. The low power separation social orders are those in which disparity is less endured. The benefits joined with the position are not effortlessly acknowledged. In the way of life with low power remove the freedom is more esteemed then the similarity. This report concentrates on the impact of the nation of origin culture in undertakings with remote capital working in Poland (Martin & Nakayama, 2007). The principal objective of this paper is to clarify diverse contrasts in inward relations in the middle of directors and workforce, which incorporate level correspondence and workers' support, which are brought about by the level of force separation. The second objective is to demonstrate the level of execution of society limited practices in aforementioned territories in the host nation. In writing one can discover a few studies proposing arrangements of the way of life measurements. The most famous among such arrangements was proposed by Hofstede who led exploration among IBM laborers from diverse nations. He distinguished five measurements: independence/communalism, force separation, manliness/womanliness, instability evasion and long haul introduction (Wang & Ahmed, 2003). Among these measurements there is one particularly connected with relations in the middle of chiefs and representatives, it is the force separation. As per Hofstede's definition, the force separation is joined with the social acknowledgement of unequal conveyance of the force. This disparity can be associated with esteem, riches and influence. The level of the force separation depicts "how the way of life endures and cultivates pecking requests, and how effectively parts attempt diminish them". The high power separation social orders are portrayed by the resilience for disparity and the parts of such social orders concur that power ought to be unequally imparted. The individuals with higher social position acquire various benefits and it is considered as something right and characteristic (Martins & Terblanche, 2003). The low power separation social orders are those in which disparity is less endured. The benefits joined with the position are not effortlessly acknowledged. In the way of life with low power remove the freedom is more esteemed then the similarity. The consequences of examination focused around two nations, France as well as Sweden are introduced in this report. The fundamental part of lower level administration is to give counsel to top chiefs and not to oversee or to take choice all alone. Disregarding the high power remove in the French undertakings the relations between the chiefs and their subordinates are exceptionally solid. The director deals with the subordinates along with their private life yet these types of relations are considered formal and not benevolent (Knight & Trowler, 2000). Top supervisors are considered as an extremely exceptional persons with high power. Their contacts with representatives from lower levels are constrained and extremely uncommon. Much of the time the interior correspondence in French endeavors is level and extremely formal High progressive structure brings about abhorrence for passing the data and enabling the subordinates. A standout amongst the most underlined attributes of the Swedish administration is abnormal state worker interest. They have high self-rule and the worker contribution is considered as an imperative component. The administrators give just general proposals, and the control is restricted to urge representatives to take singular motivating force, which is associated with the abnormal state of independence and inclination to stay away from clashes (Trompenaars & Hampden-Turner, 1998). Moreover, the Swedish administration is portrayed by a substantial number of data went to a worker. The inner correspondence is thought to be essential and, in understanding to low power separation, is immediate. Mulling over the bearings of the force separation measurement impact on relations in the middle of administrators and workers and the practices here in ventures working in Sweden and France the three theories, the positive check of which affirms home-nation society impact, are made (Laughlin, 1987). While contrasting the relations in the middle of administrators and workers in Swedish and French undertakings and to discover to what degree the distinctions are created by the nation of origin society. Furthermore the practices here are dissected to demonstrate the level of ampleness to the Polish society and desires of Polish representatives. The decision of the nations was controlled by the distinctions in society in the measurement of force separation, bringing about picking France and Sweden. The exploration was led among the remote undertakings working in Poland whose fundamental capital source was either French or Swedish as this empowered to analyze the worker relations in the nation of origin and in the host nation. Two Swedish assembling plants and two French assembling plants are inspected in the examination which was focused around meetings, documentation investigation, and polls (Tomlinson, 1991). The meetings were led essentially with the staff in charge of human asset administration (along with the fourth persons) as well as were focused on the examination of the parts of and the methods for correspondence in the middle of supervisors and workers and the techniques of representatives' strengthening. In the second piece of the examination the documentation associated with the interior correspondence was broke down, particularly perceive sheets and pamphlets. The main piece of the survey comprises of four inquiries went for looking at the workers' impression of relations between the administrator and the staff and the choice making methodology. Each one inquiry depicts two separate circumstances and respondents were solicited which from them is closer to the truth in their undertakings. The decision made was communicated on a five point scale (Cooke & Rousseau, 1988). The second piece of the poll exhibits a set of three elements asking how those variables propel workers to function and how they are spoken to in the work place. The specimen comprises of 03 workers from two endeavors working in Poland with a capital offer from France. To lessen the differing qualities created by the distinctions associated with the position involved in ventures, the poll based exploration was restricted to the organization and generation representatives, barring directors. To begin with, the normal for every undertaking was figured, then the normal for the endeavors with French along with the Swedish capital (Jermier, 1998). The respondents partaking in the study of the undertakings with French capital surveyed that the force is focused around power associated with the position in progressive system as opposed to on capability in bigger degree than workers in ventures with Swedish capital. One of the greatest contrasts in reactions were associated with the inquiries regarding the benefits for the workers in a top positions in an authoritative progression. The exploration among the workers in the endeavors with Swedish capital permits to express that in these undertakings there are less unique benefits for the representatives on top of the authoritative structure. The examination utilizing meeting likewise permits to express that in the Swedish endeavors the relations in the middle of administrators and workers are much more open. Particularly in one of them accentuation was on the imperativeness of the libertarianism in the relations inside the association (Detert, Schroeder & Mauriel, 2000). In the endeavors along the French capital, less conceivable outcomes for direct contact between generation representatives and administrators than in the Swedish undertakings, are there. These results are in accordance with past expectations that if there are impacts of the nation of origin society, then Swedish ventures ought to be more populist and the separation between top-supervisors and workers ought to be little along with contacts which are more open (Deem & Brehony, 2000). The aftereffects of the exploration led demonstrate that in French as well as Swedish ventures the inner correspondence is somewhat various leveled and in top-down bearing. In French undertaking a little number of data is exchanged to workers. Just the data joined with the generation pointers were routinely exchanged to workers amid unique gatherings or utilizing the notice sheets. In one of the endeavors the upward correspondence was acknowledged by the use of the unique box for the workers' recommendations and inquiries which are talked about amid week by week gatherings (De Witte & Van Muijen, 1999). Furthermore there is a representative assessment study led consistently or even two. The aftereffects of the exploration demonstrates that, in the explored ventures, the practices associated with worker cooperation in choice making are steady with these of their nation of origin society. The distinctions in human asset administration practices and the worker's evaluation in the investigated ventures permitted to check emphatically two out of three postured speculations accepting that the nation of origin society has impact on relations in the middle of directors and representatives in the undertakings with the capital from the two countries, Sweden as well as France (Cameron & Quinn, 2011). These results incite addresses about the impact of the exchange of the host practices to Poland. Are such practices suitable in Polish social foundation? How Polish representatives respond to them? Second piece of survey used to direct the overview among representatives served to answer all these inquiries. The consequences of the exploration demonstrate that on account of the scrutinized endeavors the level of the worker fulfillment from the relations in the middle of them and the supervisors and from the atmosphere in the working environment is higher in French ventures (lower contrasts in the middle of necessities and the current circumstance in undertakings). Just the cooperation in choice making was informed higher in Swedish than in French undertakings yet this component is likewise less esteemed by the representatives partaking in the overview (Weil & Kincheloe, 2004). It can be clarified by the amount of force in the Polish society. As indicated by Hofstede the force separation list for a Polish society is 68. This proposes that the Polish culture in this measurement is more close to French instead of Swedish culture as well as Polish representatives who incline towards the adjustment of French practices which is more totalitarian administration style and is joined with it, – littler cooperation in choice making. We can reach two fundamental inferences from the exploration led. The principal and most evident ramifications rising up out of the exploration is, the ventures along with remote capital working in Poland and the subject of the examination in this report exchange to the host nation their own broadly different style of relationships with the supervisor along with the workforce, particularly joined with the contribution of the workers and the sort of their relationships with their subordinates (Evered & Louis, 1981). A second conclusion ought to be taken under thought by an HR as well as particularly by experts – chiefs working in the organizations with an outside capital offer. The exchange of practices from the nation of origin is more satisfactory by host nation's workers if the host nation society is closer to the nation of origin society. 1.Cox, T. H., & Blake, S. (1991). Managing cultural diversity: Implications for organizational competitiveness.The Executive, 45-56. 2. Schein, E. H. (1990).Organizational culture (Vol. 45, No. 2, p. 109). American Psychological Association. 3. Alvesson, M. (2012).Understanding organizational culture. Sage. 4. Marquardt, M. J. (1996).Building the learning organization. McGraw-Hill Companies. 5. Cascio, W. F., & McEvoy, G. (1992).Managing human resources: Productivity, quality of work life, profits (Vol. 2). McGraw-Hill. 6. Deshpande, R., & Webster Jr, F. E. (1989). Organizational culture and marketing: defining the research agenda.The Journal of Marketing, 3-15. 7. George, J. M., Jones, G. R., & Sharbrough, W. C. (1996).Understanding and managing organizational behavior. Reading, MA: Addison-Wesley. 8. Alvesson, M., & Deetz, S. A. (1969). 1.7 Critical Theory and Postmodernism Approaches to Organizational Studies. 9. Tomlinson, J. (1991).Cultural imperialism: A critical introduction. Bloomsbury Publishing. 10. Martin, J. N., & Nakayama, T. K. (2007). Intercultural communication in contexts. 11. Schein, E. H. (2006).Organizational culture and leadership (Vol. 356). John Wiley & Sons. 12. Cooke, R. A., & Rousseau, D. M. (1988). Behavioral Norms and Expectations A Quantitative Approach To the Assessment of Organizational Culture.Group & Organization Management, 13(3), 245-273. 13. Cox, T. (1994).Cultural diversity in organizations: Theory, research and practice. Berrett-Koehler Publishers. 14. Wang, C. L., & Ahmed, P. K. (2003). 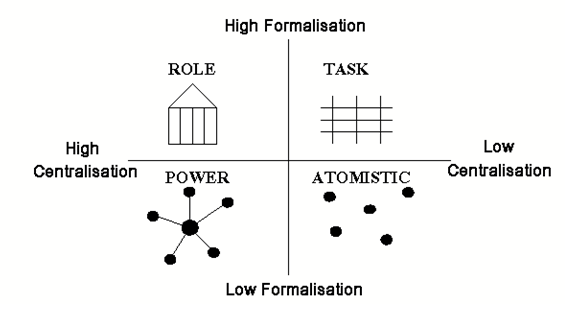 Organisational learning: a critical review.Learning Organization, The,10(1), 8-17. 15. Schein, E. H. (1984). Coming to a new awareness of organizational culture.Sloan management review,25(2), 3-16. 16. Martins, E. C., & Terblanche, F. (2003). Building organisational culture that stimulates creativity and innovation.European journal of innovation management, 6(1), 64-74. 17. Alvesson, M. (1995).Cultural perspectives on organizations. CUP Archive. 18. Smircich, L. (1983). Concepts of culture and organizational analysis. Administrative science quarterly, 339-358. 19. Knight, P. T., & Trowler, P. R. (2000). Department-level cultures and the improvement of learning and teaching.Studies in higher education, 25(1), 69-83. 20. Gagliardi, P. (1986). The creation and change of organizational cultures: A conceptual framework.Organization studies, 7(2), 117-134. 21. Trompenaars, F., & Hampden-Turner, C. (1998).Riding the waves of culture (p. 162). New York: McGraw-Hill. 22. Evered, R., & Louis, M. R. (1981). Alternative perspectives in the organizational sciences:“Inquiry from the inside” and “inquiry from the outside”.Academy of management review,6(3), 385-395. 23. Mezirow, J. (1998). On critical reflection.Adult Education Quarterly, 48(3), 185-198. 24. Schein, E. H. (1996). Culture: The missing concept in organization studies. Administrative science quarterly, 229-240. 25. Laughlin, R. C. (1987). Accounting systems in organisational contexts: a case for critical theory.Accounting, Organizations and Society, 12(5), 479-502. 26. Weil, D. K., & Kincheloe, J. L. (Eds.). (2004).Critical thinking and learning: An encyclopedia for parents and teachers. Greenwood Publishing Group. 27. Lam, Y. J. (2002). Defining the effects of transformational leadership on organisational learning: a cross-cultural comparison.School Leadership & Management, 22(4), 439-452. 28. Cameron, K. S., & Quinn, R. E. (2011).Diagnosing and changing organizational culture: Based on the competing values framework. John Wiley & Sons. 29. Leonard, M., Graham, S., & Bonacum, D. (2004). The human factor: the critical importance of effective teamwork and communication in providing safe care. Quality and Safety in Health Care,13(suppl 1), i85-i90. 30. De Witte, K., & van Muijen, J. J. (1999). Organizational culture: Critical questions for researchers and practitioners.European Journal of Work and Organizational Psychology, 8(4), 583-595. 31. Deem, R., & Brehony, K. J. (2000). Doctoral Students' Access to Research Cultures-are some more unequal than others?.Studies in higher education, 25(2), 149-165. 32. Shanks, G., Parr, A., Hu, B., Corbitt, B., Thanasankit, T., & Seddon, P. (2000). Differences in critical success factors in ERP systems implementation in Australia and China: a cultural analysis.ECIS 2000 Proceedings, 53. 33. Detert, J. R., Schroeder, R. G., & Mauriel, J. J. (2000). A framework for linking culture and improvement initiatives in organizations.Academy of management Review, 25(4), 850-863. 34. Jermier, J. M. (1998). Introduction: Critical perspective on organizational control.Administrative Science Quarterly, 235-256. 35. DiMaggio, P. (1997). Culture and cognition.Annual review of sociology, 263-287. 36. Kearns, G., & Philo, C. (1993). Culture, history, capital: A critical introduction to the selling of places.Selling places: the city as cultural capital, past and present, 1-32. 37. Andreotti, V. (2006). Soft versus critical global citizenship education.Policy & Practice-A Development Education Review, (3). 38. Dey, C. (2002). Methodological issues: the use of critical ethnography as an active research methodology.Accounting, Auditing & Accountability Journal, 15(1), 106-121. 39. Aktouf, O. (1992). Management and theories of organizations in the 1990s: toward a critical radical humanism?Academy of Management Review, 17(3), 407-431.